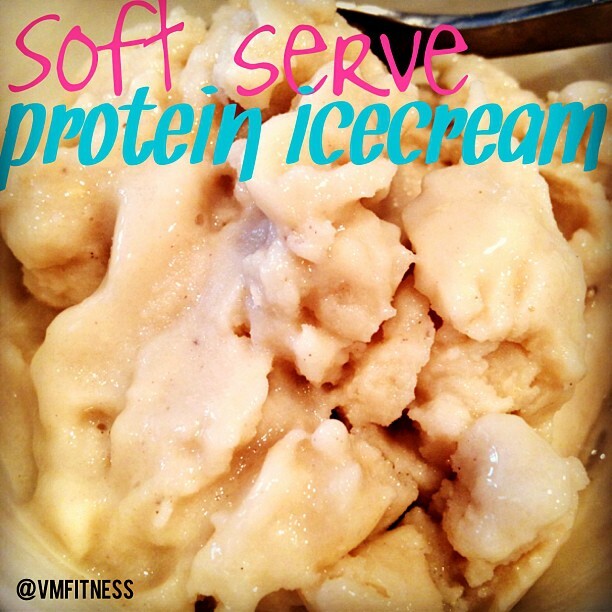 VMfitness: Easiest Soft Serve Protein Ice Cream! Low Carb, Gluten Free, High Protein! Easiest Soft Serve Protein Ice Cream! Low Carb, Gluten Free, High Protein! This recipe literally takes maybe 5 minutes total and you get great soft serve consistency delicious protein ice cream! If you use "VMFITNESS" at checkout at mgnstore.com, you'll get 20% off! Add the protein and milk to the small ziplock - mix it a bit and zip closed. Place the smaller ziplock into the larger one full of ice. Now SHAKE WHATCHA MOMMA GAVE YA! Feel free to add toppings like fruit, peanut butter, cocoa to make it chocolate, nuts, coconut shreds, ETC!